pieced and waiting | Flickr - Photo Sharing! littleman'smom, UncommonGrace, and 7 other people added this photo to their favorites. I adore that tree print (but I hear it's no longer available), and those little green apples. Any idea where the apples came from? I would love to grab a 1/2 or so. Thanks! Thanks! I checked and the little apples are gone too. :-( I'll have to stalk Superbuzzy to see if more pop up. Gorgeous! That's going to be a very loved quilt! 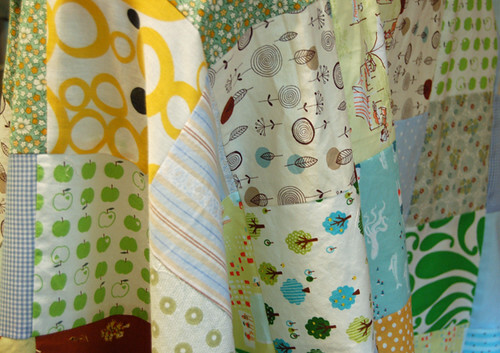 I love your fabrics and combinations - this will be a great quilt! I really, really like the fabrics! Great choices, E! Lovin this. Bet it will be condusive to so many sweet dreams! the fabrics you choose are just wonderful.....love! its going to be so lovely!! !